With the introduction of our unique Lymphoedema techniques, Kinesio Taping is sweeping the world as an effective and exciting modality that complements other "standard" Lymphoedema treatments. 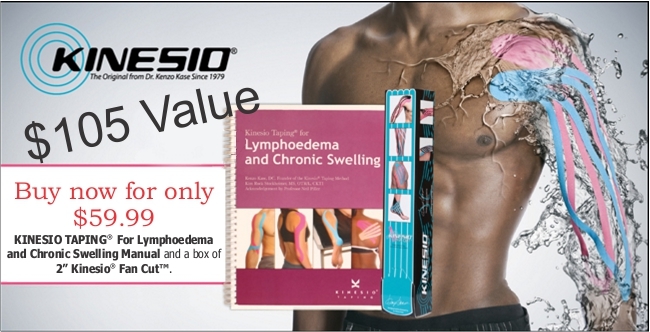 Kinesio Taping for Lymphoedema and chronic swelling will show you step by step, easy to read, full color instruction, of over 108 common and not so common applications associated with Lymphoedema, chronic swelling, and scar management. Kinesio Fan Cut provides your patients with the benefits of edema/inflammation taping and saves valuable time in the process. Kinesio Fan cuts are made from the same Kinesio Tex Gold you have grown to love. The Kinesio fan cuts assist in the removal edema and inflammation by assisting fluid towards a less congested pathway and lymph node. So, whether you're taping for circulation, lymphatic drainage, ankle/knee sprain or a bruised hamstring, Kinesio fan cuts have got you covered. The lifting effect and unique characteristics of the Kinesio Tex Tape with the Kinesio Taping Method decreases pressure and opens pathways.